Mundosparalelos Information Dance Plymouth Pole Attik Dance Community Platform - 16th March 2011. Attik Dance Community Platform - 16th March 2011. 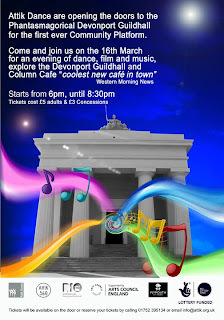 On 16th March myself and other artists will be performing at the lavishly refurbished Devonport Guildhall. Artists and events on the night will include Ian Gilson performing live music, The Camper Obscura, Kingsbridge School, Thom Racket Dance, Access Theatre, Emily Dobson, Lucy Teed, Freefall dance, classes, Spindrift Dance Company, Attik 360 and Strictly collaborative. The night will also include a series of short films being screened in the Lord Mayors Parlour. The whole evening will be photographed by local tog Stacey Hindom. Attik Dance will be hosting a dance platform at the Devonport Guildhall to raise funds for Attik 360 dance classes. 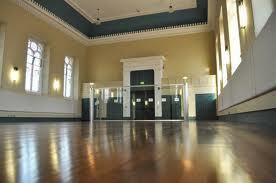 Attik 360 are opening the doors to the Phantasmagorical Devonport Guildhall for the first ever Community Platform. On the 16th of March 2011 there will be performances of dance, film and art work displayed throughout the building. Attik 360 provides classes for adults with learning and physical disabilities. From the funds raised we will be able to buy equipment for the dancers to allow the sessions to be accessible and inclusive to all of the members. Attik Dance will invite local dance and theatre groups to perform; our aim is to bring 170 local people into the newly renovated venue. The event will promote the arts and also local businesses and organisations within the area. Attik are looking for local businesses to sponsor the event, to be a part of the celebration and the regeneration of Devonport. In order for this event to be successful and to raise sufficient funds for Attik 360 programme, we need exciting businesses and organisations to donate costs for food and refreshments for the night, raffle prizes, running costs of the event, decoration, costs for marketing etc, so that this event is like no other. We would like to say a big Thank you to Print Options in Millbrook and David Folley for making this event possible. For more information please call Attik Dance on 01752 395134 or email Clair. Hope to see some of you at this event and will share info and pictures after the night. Off to PDC approved 360 pole dancing in Bristol now for my 3 hours worth of pole dance training with Becca Butcher!